The paramount aim of SERVICES is to establish a cross-border cooperation in Central and Eastern Europe as well as Southeast Europe for joint applications in international research funding programs. The main focus lies on cultural ecosystem services to assess nature perception due to the resettlement of wildlife. In the first phase, potential science and technology partnerships will be acquired by a series of research stays and workshops. By bilateral, European as well as international research programs, the primary research activities and the research profile are to be sharpen. Establishing a network of partners from various science disciplines (ecology, economy and spatial planning), private sectors and non-governmental organizations is a priority issue. Furthermore, developing new software solutions and implementing scientific networks to manage wildlife is necessitated for operationalizing proper planning processes. The results will be published in a joint synthesis paper. The second phase is characterized by finding a common research focus, including a feasibility study of the project proposal. To complement missing expertise of the consortium, additional partnerships (from science or private companies) are being involved. 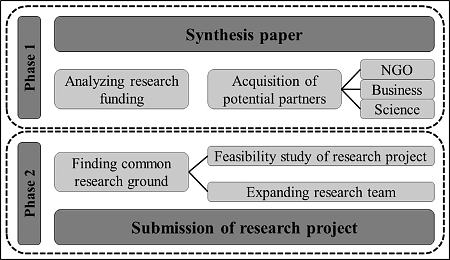 Finally, the research project will be submitted either to a European or international funding program.